Information, Publicity and Broadcasting Services deputy minister Energy Mutodi has rubbished claims by Nelson Chamisa that he met with President Cyril Ramaphosa last week to seek help from SA to break Zimbabwe's political and economic impasse. Mutodi said SA ambassador to Zimbabwe Mphakama Mbete had said he was not aware of any meeting Chamisa had with Ramaphosa ostensibly to seek his help to mediate in talks with President Emmerson Mnangagwa to stem Zimbabwe's worsening economic crisis. Economic conditions have deteriorated since July's contentious election won by Mnangagwa, as world powers keep their distance. 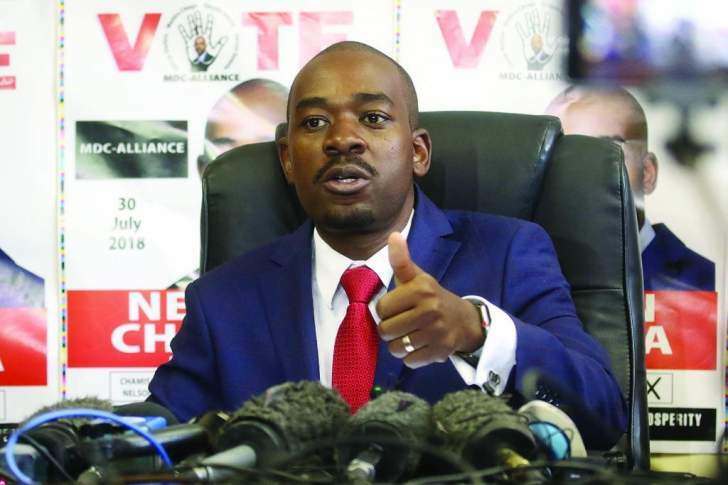 Nelson Chamisa, the leader of the Movement for Democratic Change, the main opposition party in the former British colony, has been pushing for a "transitional authority" to "move the country forward". Mnangagwa has outrightly rejected this. "I've spoken to the SA Ambassador to Zimbabwe Cde Mphakama Mbete & he has said he is not aware of any official meeting between President Cyril Ramaposa & opposition MDC leader Nelson Chamisa. The SA gvt is fully behind President Mnangagwa & will not waste time entertaining MDC," Mutodi said on microblogging site Twitter last night. In a message he posted on Twitter this week, Chamisa said he had sought assistance from Ramaphosa over Zimbabwe's challenges. "A few days ago I had a fruitful meeting in Pretoria with my distinguished brother and fountain of wisdom the president of the republic of South Africa His Excellency Cyril Ramaphosa on a wide range of urgent and important issues regarding the well being of the people of Zim," Chamisa tweeted. MDC spokesperson Jacob Mafume was quoted saying the meeting sought to reach out to Mnangagwa. "The economic and political crisis in Zimbabwe is worsening and what is important is that this affects our neighbouring countries, particularly South Africa. We feel that Zimbabwe is becoming a regional security threat because of the failure by Mnangagwa's government to solve the political stalemate over his illegitimacy. Mafume said the meeting also centred on the recently completed commission of inquiry into post-election violence that killed six people, which concluded that Zimbabwean military's use of live bullets to put down post-election violence was "disproportionate and unjustified."